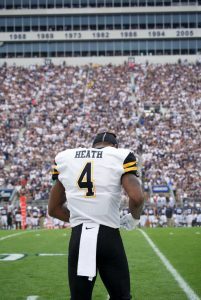 Quarterback Zac Thomas prepares for the snap against Penn State. 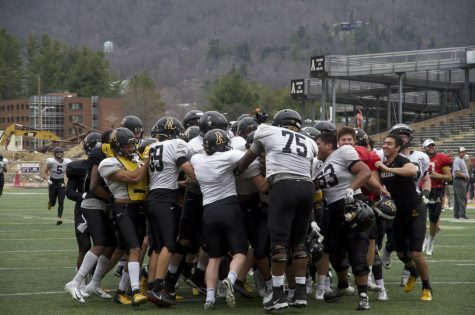 For the fourth consecutive season, the App State football team will appear in a postseason bowl after winning double-digit games for the third time in four years. 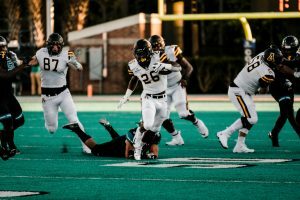 On Dec. 1, the Mountaineers defeated the Louisiana Ragin’ Cajuns in the inaugural Sun Belt Conference championship game to claim their third straight Sun Belt title. As conference champions, they earn the right to appear in the R+L Carriers New Orleans Bowl on Dec. 15 at the Mercedes-Benz Superdome in New Orleans. App State’s opponent in the New Orleans Bowl will be the Middle Tennessee State Blue Raiders, the runners-up in the Conference-USA. 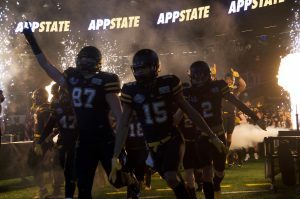 The Blue Raiders finished their regular season schedule with an 8-4 record, including a win over fellow App State opponent Charlotte, before losing to the UAB Blazers 27-25 in the Conference-USA championship game. The Mountaineers and Blue Raiders have met three times in previous years, but not since 1992, according to winsipedia.com. Middle Tennessee owns the series record 2-1, with the Mountaineers’ only win coming in 1974. The Blue Raiders’ .572 all-time win percentage ranks No. 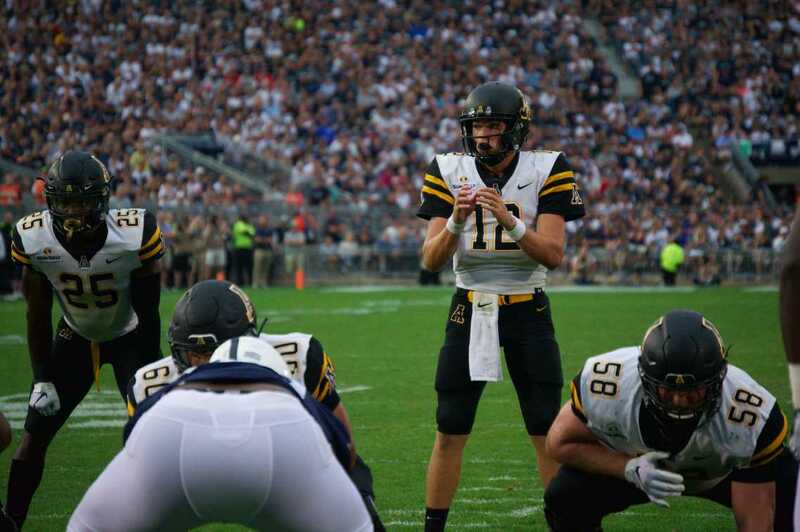 46 in the nation, while App State’s .641 win percentage ranks No. 15 of 130 teams. This season, the Mountaineers seem to have the edge. They won 10 games this season while Blue Raiders won eight. 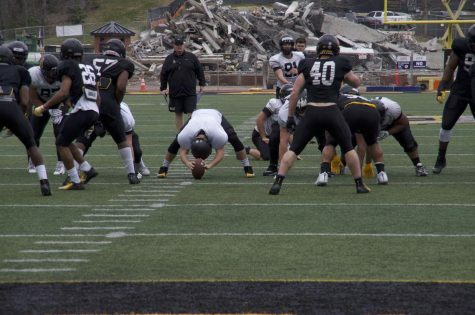 App State averaged 36.67 points per game, which is over seven more than the Blue Raiders’ average. 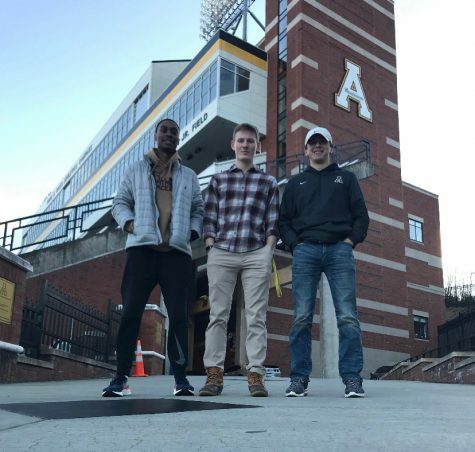 App State rushes for an average of 241 yards per game, over 100 more than Middle Tennessee, and also averages over 30 more yards in total offense, according to App State Athletics. On defense, the Mountaineers average 15.67 points per game and have held teams to 10 points or less seven times this season. Against non-Power Five opponents, the Mountaineers have allowed 143 points this season, an average of 13 per game. The Blue Raiders average 25.31 points allowed per game and have allowed opponents to score 30 points or more five times this season. 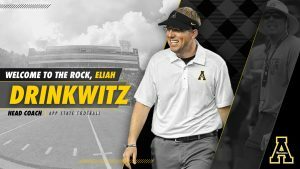 In bowl games, App State has come away victorious in all three of its previous bowl matchups, including holding the Toledo Rockets to 0 points scored in the 2017 Dollar General Bowl. 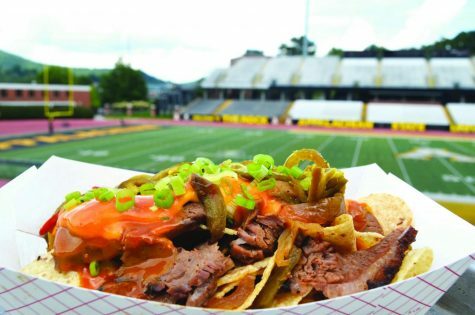 Middle Tennessee has appeared in seven bowl games, posting a 2-5 record, according to winsipedia.com. The Blue Raiders are coming off a victory in the 2017 Camellia Bowl against Sun Belt member Arkansas State, and this will be their second appearance in the New Orleans Bowl, where they defeated Southern Miss in 2006. Not every factor can be measured on a statistics sheet and when talking about the prospect of going to New Orleans, Satterfield jokingly implied his staff’s biggest concern may live off the field rather than on it.